After a week or two distracted by the OLED graphic display - which turned out to be damaged in the end - I've refocused on the core logger component. I'm now using a simple LED which changes state every time a new line is written to the log buffer. 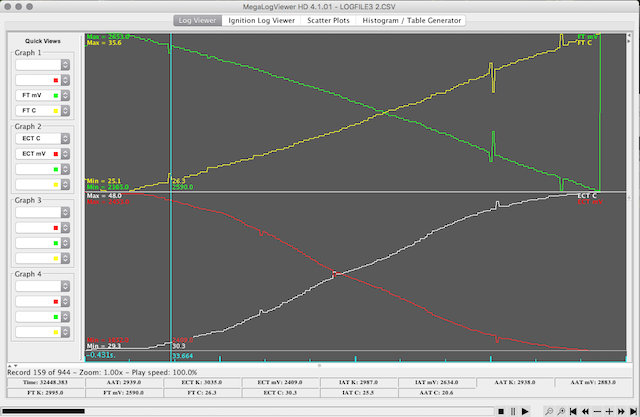 Currently this occurs at slightly less than 0.5 second intervals so it's very obvious when logging stops. The "refocusing" has meant I've found and squashed a couple of bugs that were causing intermittent issues with the log files. I've also discovered that the road speed data from the ECU is intermittently transmitted with an incorrect checksum. Until I found this issue I had assumed that I was logging too fast. Now that I've added handling for incorrect checksums the diagnostic connection will keep running after "ignition off" until the ECU shuts down. With a bunch of bugs fixed the logger had a short road test this afternoon. In previous tests the connection would drop after 3 minutes maximum. This time around I was able to take the D2 for a 15 minute drive including a short run on a nearby freeway without out a hitch. I did have a moment of fuel cut as I accelerated on to the freeway and the logs show clearly the MAF sensor voltage climbing above the 4950mV upper limit, and the MAF reading dropping to 0. A second run to work, to pick up a few things gave another opportunity to test the stability of the logger. The round trip was just under 30 minutes and I found I was able turn the motor off, switch back to accessory position, grab the things I needed from the office, then restart the engine and drive home without dropping the connection. The Nanocom is lucky to do the trip one way without throwing in the towel. This is a quick comparison of the "Airmass per cycle" figures the ECU calculates from the MAF and MAP done using the MegaLog Viewer scatter plot function. The logging to sd card is proving to be a bit of a case of one step forward, two steps back. Most of the the difficulty has resulted from the decision to make the logging "user" configurable. Rather than the fixed set of logged parameters that Td5 owners are familiar with from the Nanocom, one of the goals is to allow granular parameter logging . Not all data is available as a single request, but for those that are it's possible to log at more than 10 times per second giving very detailed snapshot of sensor performance. The screen grab below shows some of the data captured on a short 4 minute run around the block. The top graph is Fuel Temp in C and FT sensor voltage. The lower graph is Engine Coolant Temp and ECT sensor voltage. These are being sampled at slightly more than 4 times per second vs the Nanocom sample time of once every 1.25 seconds. The log viewer app I'm using is MegaLogViewer HD . The big plus of this over the free Nanocom log viewers is that it's very flexible and allows user defined calculations based on the log data. Read more about Live data, at last. After a long hiatus I've been working on getting the Td5 Data Logger (aka Raijin Project) up and running. The low level connection management code has been rewritten so it's a lot more robust. One of the big improvements is that it now uses the 5ms minimum inter byte timing specified by ISO14230 - in practice it's actually between 4.25 and 4.75ms. My theory is this timing allows the ECU more time to handle core processes so should help prevent dropped communications sessions under load. It's still missing error handling and recovery but otherwise working well. The point to point wired board I've been using for development was a bit impractical for in-car testing, so I've had a piggy back board made up which should make it slightly easier to work on. The board is designed to plug on to a Fubarino SD development board, and has a ISO9141 interface chip, k-type thermocouple interface, 5V voltage regulator running off the OBDII port supply, a 5 way tact switch, and a connector for a small 0.96" OLED. The whole thing is about 25mm by 75mm. I got notification today that the test boards have finally been shipped, a week later than the original estimated shipping date. I'll be interested to see how they turn out as this was the first time I've used Eagle to design a board and the first time I've had one of my own designs fabricated. While the Nanocom is a pretty useful diagnostic tool it leaves a lot to be desired in terms of datalogging, so I've been messing around with the idea of building a dedicated datalogger for the Td5. The time I've put into reserve engieering the ECU code has been very useful in this regard. I have been able to identify the routines used to generate and verify the security keys - done using linear feedback shift registers - which are required to gain access to many of the diagnostic functions of the Td5 ECU. At this point I've been able to sucessfully negotiate a connection with the ECU and request "live" data. On my test ECU running on the bench I'm able to request a single parameter every 20ms. Unfortunately this seems to take a bit of a hit when the ECU is actually hooked up to a running engine, so this appears to best possible under ideal conditions. Nonetheless it appears that it should be possible to log full engine data at around 3-5 times per second, which is substainally better than the Nanocom's once every 1.1 seconds. By prioritising requests so that slow changing data is requested less frequently it should be possible to log critical parameters 10 times per second or faster. I've also verified that it is possible to request specific data from the ECU providing you where in memory the data is stored. This opens up the possibility of logging the values returned for ECU map lookups. As an example you could log throttle amount, aircharge and the result of the smoke map lookup. It's still early days yet and I'm currently working to make the code I have already written more robust. The current wish list also includes an interface for a EGT probe, and ability to connect of other sensors that output 0-5V. I've attached a screen capture showing a capture of "Raijin" ( the shinto god of storms and thunder) sending a key response and the ECU responding with a security access OK message. Top line is the transmit line and the bottom is the recive line. The ISO interface chip (ST-Micro L9637) I'm using echoes the transmitted data back on the rx line hence the duplication of the TX packets.